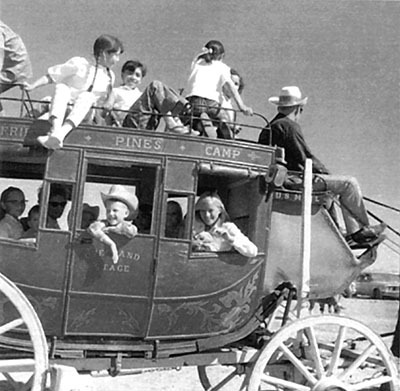 The first of many Maricopa Stagecoach Days began on Sunday, May 3, 1959, with a BBQ dinner, and a slew of events including free rides on three stagecoaches – authentic, old-time stagecoaches with beautifully groomed horses. Drivers were trained and skilled in handling four-horse teams that allowed children to relive Maricopa Wells’ history with stagecoach rides through the desert. The only decision kids had to make was who would get the privilege of riding shotgun. Horseracing and a cutting horse contest with some of the best quarter horses in the country was promised to be one of the highlights of the day. Other fun events included contests for bearded men, and women in long dresses who would later serve you barbecue. Everyone was encouraged to bring bonnets or hats and an attitude for enjoying the day. On that first stagecoach day, the Rotarians expected a crowd of more than 2,000 and a pocketbook full of dollar bills to put a dent into the 1958 debt of $50,000 incurred for the community swimming pool’s construction. The Maricopa swimming pool project began back in 1956 when the Rotary Club researched the needs of Maricopa’s youth and a viable project for them to embrace. It was decided a swimming pool would reduce or eliminate the many canal deaths in Maricopa and provide entertainment and exercise for its young people. The first order of business toward achieving this goal was to secure land. Farming partners John Smith and Fred Enke stepped up to with eight acres they were willing to donate for a swimming pool and library. In the fall of 1957, local farmers donated bales of cotton, which was processed by the gins without charge, to ante up about $12,000. With good land and earnest money in hand, the Rotary Club organized a project that satisfied the building of a swimming pool and provided entertainment and embraced Maricopa’s heritage – Stagecoach Days. 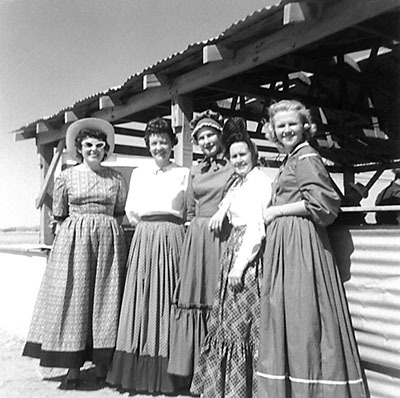 The good ol’ days of whoopin’ and a hollerin’ brought in more than the anticipated 2,000 people, who celebrated with Maricopa throughout the day with BBQ atop cotton trailers, and way into the night with a frolicking hoedown that rocked the old barn into the morning hours. For years to come, Stagecoach Days celebrated Maricopa’s heritage and raised money to pay off and maintain the swimming pool. The event has brought in sky-diving, horse racing, cutting horse contests, gymkhanas, Maricopa RCA rodeo Quadrille team performances, and celebrities such as Amanda “Miss Kitty” Blake of Gunsmoke fame. 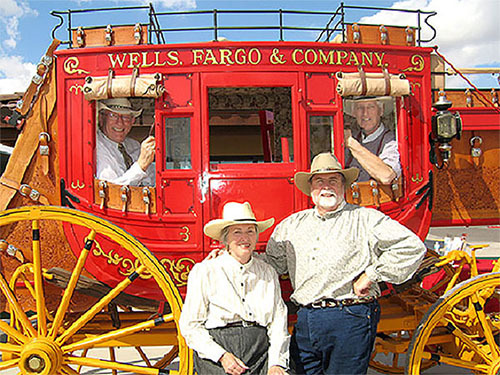 These days the City of Maricopa encourages community organizations to create activities during the traditional time for Stagecoach Days, which is the second and third weeks of October.